I like to eat cookies, especially with my morning coffee. I sit alone outside our RV in the day’s first light, listen to the birds sing, stare off into my thoughts and eventually pick up my laptop and begin the new-age conversation that has become a near-necessity to so many; checking email, drafting a blog post, scrolling facebook, all while Pandora plays Native American flute music or lively Bluegrass depending on my mood. I’ve been out of cookies for several days, a situation that needed to be remedied as soon as possible. This afternoon, ingredients finally obtained, I decided to experiment with a tried-and-true recipe, just for fun. 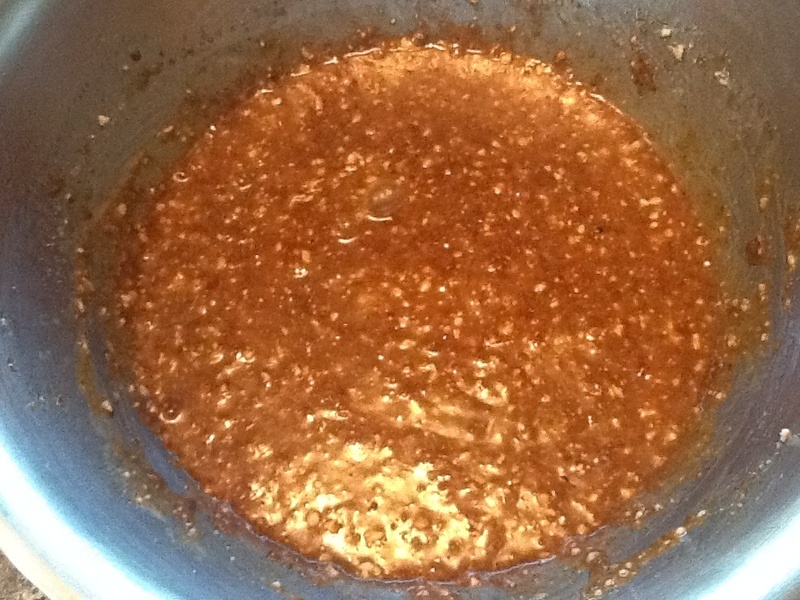 I also decided to take photos as I went along and share the new recipe, including adjustments along the way. 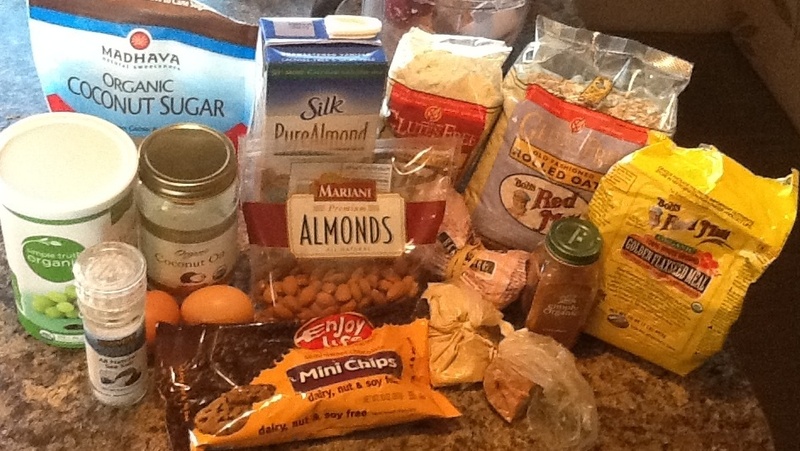 Below are the ingredients I used. Getting them all in the picture was no small feat. It was Devyn who figured out how to do it. Normally I use Extra Virgin Coconut oil, Real Salt (the brand name) and the not-golden flax meal but Fry’s Foods doesn’t sell them and I wasn’t about to wait several days until we made a run to Whole Foods or Trader Joe’s, both an hour’s drive in opposite directions either to Phoenix of Tuscan. 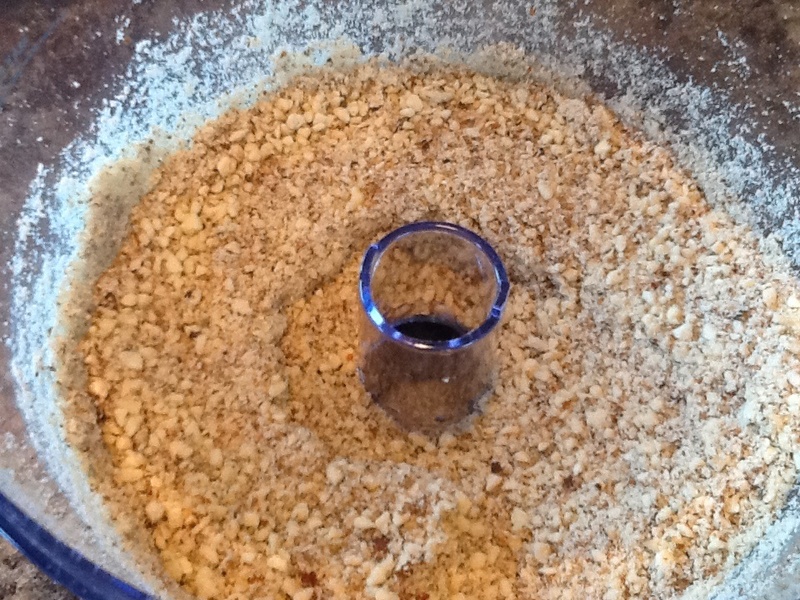 3/4 cup almond-meal in with the wet ingredients. I add the picture below to show the consistency I opted for for the almond-meal. Normally I add the almond-meal to the dry ingredients, but oh well. I did get off the phone before continuing, even to mix it all together. I am not one of these multitasking wiz’s. Pictured below are the two bowls full, ready to be combined, dry into wet. Yes, I’m a bit picture-share happy. Once combined, I remembered I forgot to add 3 Tbsp flax meal. Once that was done, the base cookie batter was complete. When I’m experimenting with a recipe I always do a small test-batch. At this point, I baked four cookies for several minutes. Here’s where it gets tricky. In an RV, I have a small propane oven that is not consistent like a home oven. I suggest if you make these at home, set a timer for 9 minutes, then check to see if the cookies are browning at the edges. If not, add 2 minutes at a time until done. My best guess is that 11 minutes is just right, but since ovens vary, better to be safe. 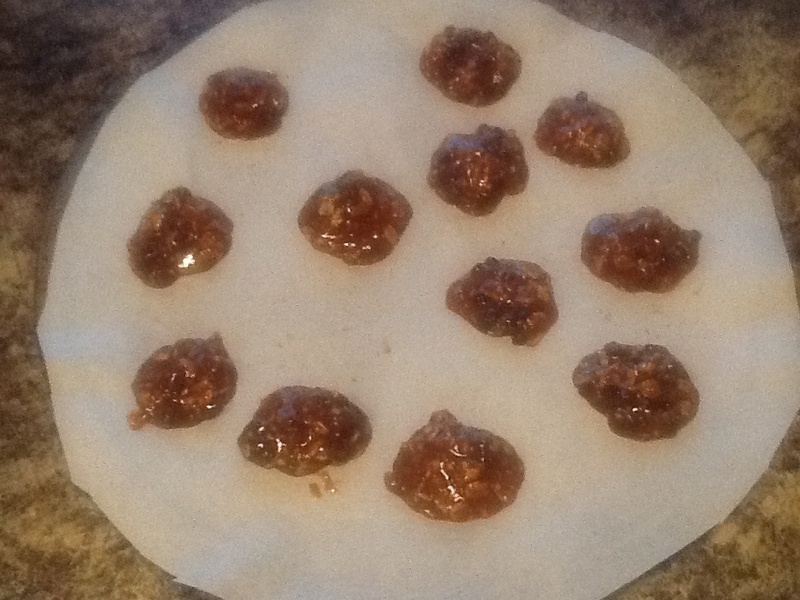 So I added 1/4 cup grapeseed oil and another 3 Tbsp almond milk and baked four more cookies. When these were done, both sons taste tested and gave the thumbs up. 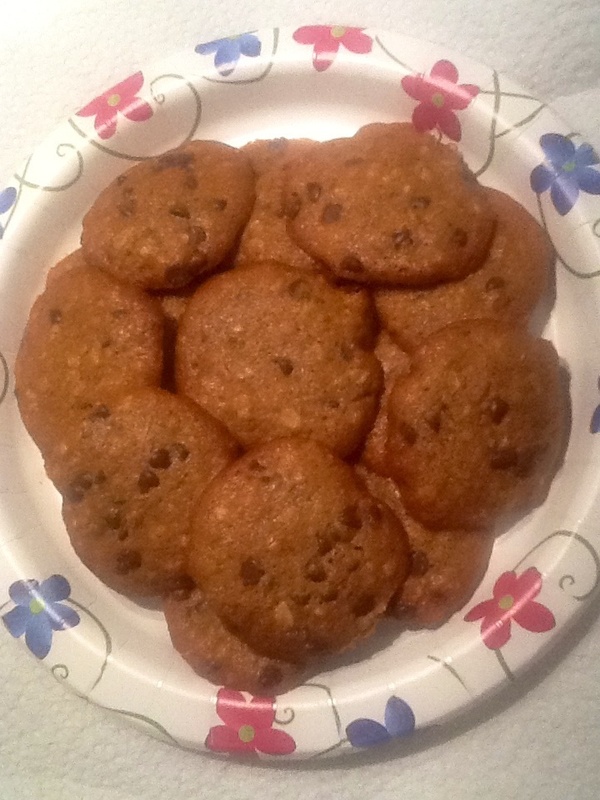 Due to the fact that this is the period of the Baha’i Fast, which lasts from March 2-20 while the sun is up, I wasn’t able to test my own cookies. But it turns out the boys are good judges of cookie quality. At 6:30pm I brewed a cup of coffee and enjoyed a few (okay, several) cookies. I use a tsp-sized ice cream-type scoop, which gives the cookies a nice uniformity. Below I share a before-baking photo so you can see our cute little cookie sheet, the only one that fits into our tiny oven. Once the batter was right, I split it into two bowls, about 1/3 in one and 2/3 in the other. I have a friend who doesn’t like chocolate chips (???!) so I make her cookies with raisins. I added 2/3 cup raisins to one bowl and 2/3 cup chocolate chips to the other. So far I’ve baked two plates-full and the rest of the batter is in the fridge. I will probably be making cookies from it for the next couple days. 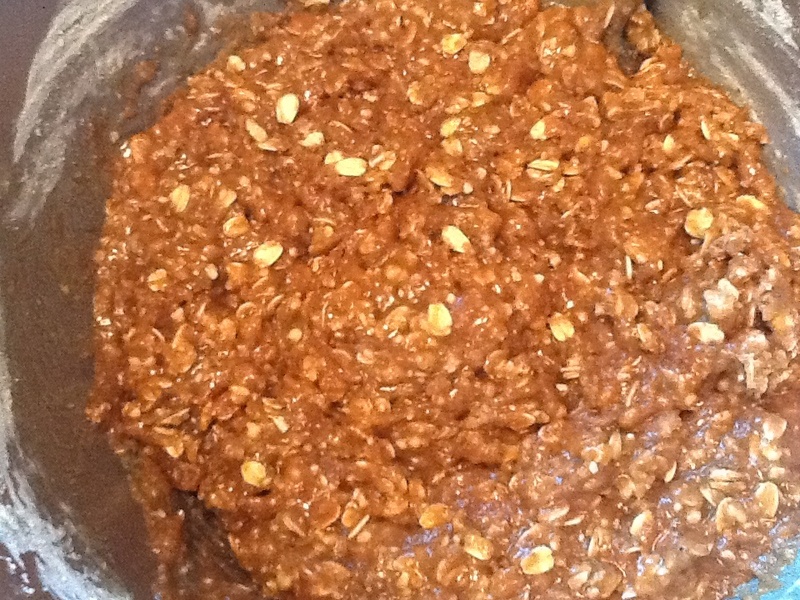 **Two “flax eggs” = combine 2 Tbsp. 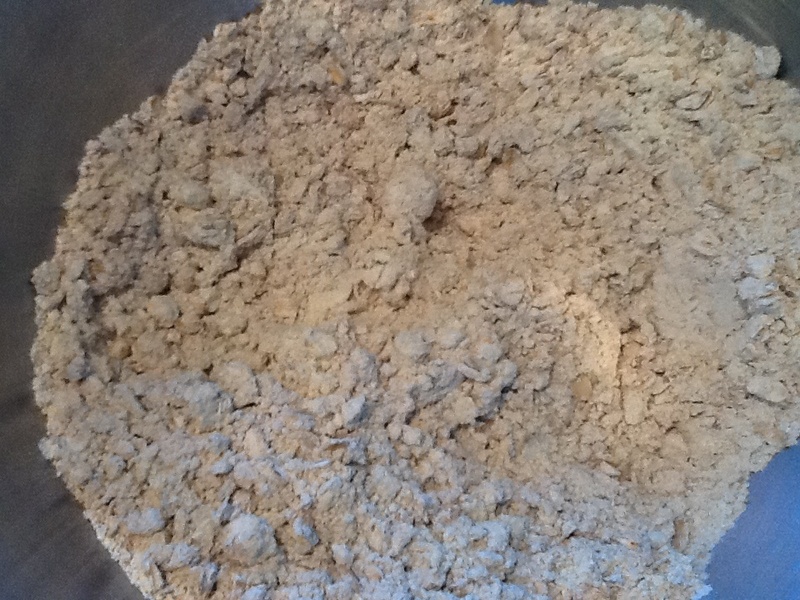 flax meal with 6 Tbsp. rice or almond milk. Barely simmer, either on the stove-top or in the microwave. Remove from heat, whip with fork. Put in fridge for a few minutes. When cool, whip again with fork and add to recipe. Out here in the desert, land crunches beneath my feet. I hear it amplified in the vast space on every side. Once, not long ago, that hollow sound of walking on dry stone and sand would haunt me, remind me I am far away from my Midwestern home, a mess, a stranger to red earth, tumbleweeds, and the silent music that is stillness being. While living in the cornfields, I would ache to go west, as if rocky mountains and fields of stone were the place I would cease to be me-afraid, me-insecure, me-saddled with doubt and a vapor of sadness in knowing I am not enough (whatever that means), the place where I would feel emotionally free and at ease in my skin, fully present. * The illusion always died with my panic as soon as we’d land in a settling spot west of Texas. A host of nameless, faceless, fictitious stories would whisper in my heart and tell me how things could go wrong in such an unfamiliar land and also back home (as if my presence kept things just right). My mom visited us in New Mexico in 2004. It was, of all the places we lived, her favorite. When we eventually moved back to Illinois, though she was thoroughly delighted to have her family less than a mile away, she lamented over not having a good reason to visit New Mexico again. That was four years ago. This summer my mom passed away (if only that could be the first line of a work of fiction). While caring for her affairs and helping my dad get settled into his new reality, my husband suggested that once I could take a needed break from tending weighty responsibilities, we spend the winter in Arizona. It sounded so far away, but it felt right. We’re here now, out in the country where the sun sets around us and on every side in giant red, orange and pink chalk-smudges. This afternoon I rode my bike around, just looking at the sky and trees, listening to the crunch of land beneath my tires and sing-song talk of birds passing overhead and everywhere. I realized then, I am home. I may feel differently when the summer wildlife and high temperatures settle in as part of daily life in these parts, but right now, today, I am perfectly content almost 2,000 miles from home base. In the mornings I sip coffee in a canvas chair outside our camper, facing a field, a mountain, several palm trees and a few kind and distant neighbors in pretty pink adobes. I listen to the birds whistle and the hawk call. In the afternoon I walk or ride my bike to nowhere and back home. The boys and I played ping-pong for most of an hour a few nights ago, striking hit-that-elusive-ball poses that kept us all laughing. Last night, at ten o’clock, we gathered with others and prayed, just to pray together, then ate cookies and visited. A bit ago I sat down to write. Eyes closed, R Carlos Nakai playing sweetness, I prayed for guidance that I might find words. 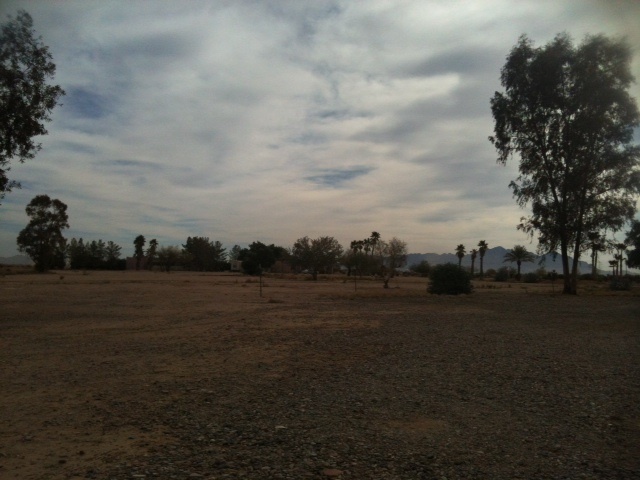 I was gifted appreciation for being able to be here in the desert, and also an image. With the fleeting thought that I wish my mother could be with us as we travel, I saw her as an invisible form whose “body” moves with mine with each foot step forward on the dusty road and each rotation of the bike’s wheels as the petals propels me forward beneath the afternoon sun. Is she here, gathering and dispelling the fear and panic I am prone to when too far from “home,” leaving me with merely a trace of the familiar uneasiness and adding a welcome joy and contentment? I am sure that is only a minute part of all she is doing, for me, my family and so many friends who have shared stories of her dream-visits since she was released from the constraints of time and space. *While still in Illinois this fall, I began to experience this presence, emotional freedom/levelness and joyful lightness I had always unconsciously assumed to be tied to place. Since it began shortly after my first visit to my mom’s graveside alone, I accept the whole of it as a gift of love. Mid December we left central Illinois and went on a seven day trek across the country, landing in our Southwestern camping spot where we plan to spend at least a few weeks. My younger son was truly sad to miss out on snow, but lucky for him we spent a night in Flagstaff just in time for their first big snow, which collected on and around our RV all night. It took two people, navigating and shoveling, to get us out of our overnight spot. I was more than nervous about pulling a trailer down into Phoenix but I was assured it was not so bad. Maybe not. However, I am SO grateful for the engine brake that kicks in on the inclines so long as the tow function is on. There was one 6% grade that lasted about 20 miles with very few level spots on the way south. Going back to Illinois I take the southern route, which is fine since we have friends and family in DFW, but that may not be for several months yet. For the first time since last winter when we came back to Illinois to help my mom after she had neck surgery, we are relaxing and enjoying having very few responsibilities. Just the everyday stuff like laundry, dishes, grocery shopping, picking fresh lemons, oranges and grapefruit from the fruit trees all over the campground. Sunsets out here are fire in the sky and gorgeous. Since arriving we’ve been to a huge Baha’i Conference (not why we came here, but good timing) and two local Baha’i gatherings. At a monthly area potlcuk/devotional gathering, a spontaneous sing-a-long/jam session started in the front room. Between three guitars, a violin, a djembe, a few other percussion instruments and on and off key voices we enjoyed a couple hours of spirit nourishment. Between these three events, we’ve made several friends and the boys are feeling right at home. Considering neither one was excited about leaving Illinois, this is a happy relief. One day, a bit of rain fell and we were gifted a colorful, sunlit arch. Not sure what our plans are beyond January, but I don’t mind. Our aim right now is to relax and so far we’re doing a fine job of it. I’m going to write something because I’m tired of listening to the non-thoughts in my head and waiting passively for some external goodness to lift me out of this time of needing to be patient. Never mind that I could sing, or laugh on purpose, or that these insights have only come since I started tapping away at keys. I could sing Janis Joplin like we used to, even though the intense, naive longing won’t be the background and foundation of my emotions the way they were when Allison and I were twenty-something and waiting to see if we would make thirty. I could put on upbeat Bluegrass music and dance, back and forth in the RV. I would feel a tingling energy ripple through my limbs and surely a smile would form where now a drawn face acts as if I haven’t a choice on how to manage such a simple task as an upward turn of certain features. I had an idea about writing Nine Acknowledgements, nine things I did in 2012 that I acknowledge respectfully rather than treating my efforts as an “of course” I did this and that. But I spent much of 2012 hovering over my mom, either in thought or real space and just now, I want to write about something else, or I want to want to. Either way, the current of sadness can rise to the surface of an otherwise joyful day as a faceless, nameless kind of tense that isn’t really anxious or nervous, just not quite right and then a word or a prayer or a song will loosen the latch and I know for sure that I can not yet comprehend that my mom is one of the ones who left their body behind in 2012. Mentally I share oft-used phrases like “too young,” “so vibrant,” “a shining soul,” but I am saying something new, with meaning that has never been shared, because she is… (because I don’t want to share) and still, she isn’t, at least, I can’t call her when I’m bored, when I’m proud, scared, hurting, excited, ready to talk her into a new idea we can pull off together. Yet here she is, present through every undertaking now, and I know it is her presence and assistance that have made life easier than I have ever known it (having the inside scoop as she does now). That and I’m listening better, more willing to accept process, less likely to hang on each curve in the road and call it the entire journey. I believe the word for this is maturity. I’m gaining a bit of it. I am not ungrateful. I am fighting a meditation that could be this moment. So I have made it into words on a page, honesty in the world and after a while I may find that quiet space and let it be, breathing in, breathing out, naming nothing. After reading over what’s been written here so far, I’ve decided to write Nine Acknowledgements of 2012 that are outside of the dominant experience of taking care of and saying good-bye to my mom. 1- I developed a brownie recipe similar to a brownie I can only buy in Springfield, MO. Only mine is better. 2- I epublished two books for Kindle. 3- I have been regaining the habit of daily exercise which mostly consist of sunshine-walks all around whatever campground we’re living at on a given day. 4- I accepted and have been practicing a method of relieving stress and transforming a day from difficult into easily manageable and even joyful. EFT. 5- I built a campfire by myself. 6- I have been eating more fruit. 7- I approached a Health Food store about carrying our cookbooks and now they are on the front shelf near the cash registers. 8- I have been getting to bed earlier and waking up earlier. 9- I scored over 2 million points on Zuma Blitz while listening to radio interviews of various Baha’i’s around the world. In the soft light of morning, I know it is time to move my laptop, coffee and phone to the couch, wrap our soft green blanket around my shoulders, turn up the heat, open the shades for the window right beside me (leaving the others closed as a kind of protective womb, a shelter from the world) listen to soft, sweet music and experience gratitude as easily as I breathe. I am in my nest, a place I haven’t been able to appreciate for months, though it has been here all along. I was not ready. Too much to do, not enough order, and my mind was unsettled, so I have been at the dining room table for two seasons, ready to tend and doing so. But the table is not so much a place of gentleness as it is a place of getting-done. Even healing is more intense there (when the tears come I strain to grasp the concrete nature of what has changed, not realizing I don’t need to grasp anything, just be, just be). The boys sleep in and I am peacefully wrapped in slow quiet. Hours pass in this seemingly timeless haven. One child wakes up and I ask him to honor the calm he has just entered. After a few words of frustration, he settles in to play with Legos and together we ease back into silence. His brother wakes as morning is about to slide into afternoon. I kiss cheeks, draw long hair away from small faces, say a few words, but only a few, then return to my nest. begins to move across the earth. and for which she does not have to work. traces of time rocking in and out of her mind. as they do every night. Why didn’t she curl up beside her? from the world beyond flesh. of visiting sadness to flow. Tonight it has come from permission to heed no shoulds, to follow only the whispered prompting of her spirit. The smooth, cool surface of the table feels good on her forehead. as we rolled toward the setting sun. in a big field shared with a few scattered Rvs. and briefly reveals a usually-hidden eye. telling him that ah! I can see your face! pull his hair back and beam. and making jokes I can’t relate to. shoulder to shoulder, slowly exhaling another day. my womb became a dwelling. until I wonder if there are any words left. to speak to me in more than shy glances. or hoping for a knock at the front door. to long for what cannot be again. not likely to fade until years have passed. I would not ask for my mom to come back. and remind me that I am not actually alone. but write through the tears. I did that wandering-in-circles thing at first, looked at prices glued under fancy coffee cups while waiting for the bathroom, wondered why a broken French Press was still on display. I came here for mental quiet and possibly the opening lines of a poem. I have no room for more food and my coffee cup is still half full. I contemplated apple juice, the least expensive way to earn a place to sit at Starbucks. The only truly available seat was in the corner, across from a young couple reading their respective Kindles. At first I didn’t want to sit in what felt like their bubble, but neither did I want to share a long table where I’d have to stretch my power cord practically over my table neighbor’s lap. I eventually sidled over to the corner space careful to not clunk my computer bag into one of the readers’ elbows. My aunt Alma, visiting with my son, nine years ago. She passed away November 10, 2006. I still miss her.